In each monthly installment of Bender, Caroline Ferguson will explore the social, cultural, and historical context of a single cocktail or boozy beverage. From settling which country lays claim to Pisco, to exploring the Carthusian Monks’ Chartreuse caves, Caroline will try to track down all the places your drink has been before it gets in your glass—always ending with a recipe of her own creation. Pull up a chair and a glass. Without a doubt, bitter drinks are having a moment. With shrubs, über-hoppy IPAs, and Italian Amari all enjoying a surge in popularity, many modern drinkers seem to have acquired a taste for the acrid. One of the foremost among these bitter beverages is Campari, a candy apple­–red aperitif of Milanese export. Thanks in no small part to the rise of the Negroni, Campari – an acquired taste if ever there was one – is in the midst of an unlikely renaissance. But although Campari may be newly popular, it’s actually a year older than the country that produces it. In 1860, a year before the unification of Italy, Lombard distiller Gaspare Campari perfected an infusion of herbs, fruits, and barks after nearly twenty years of experimenting with aperitif blends. He initially dubbed the drink “Bitter all’Uso d’Holanda,” or “bitter in the style of Holland,” hoping to imitate the Dutch spirits that were fashionable at the time. 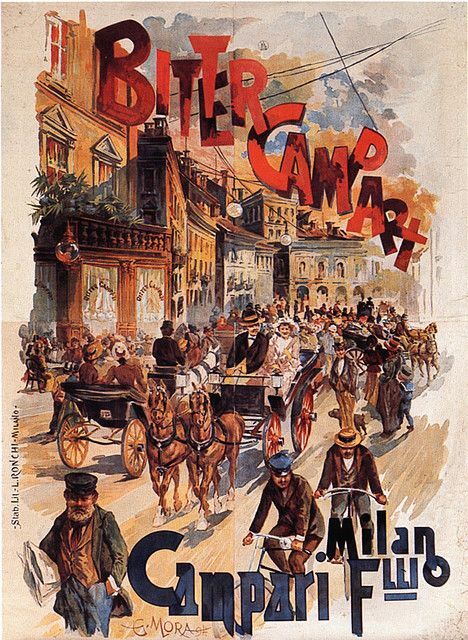 Later in the decade, after realizing he already had a badass moniker and thus renaming his proprietary aperitif after himself, Campari moved his family northeast to Milan to open Caffe Campari. There, the drink gained a devoted following, and other local bartenders soon started buying and reselling Campari to compete with Gaspare. In the 1890s, Campari developed a marketing relationship with artist G. Mora, who created the brand’s first advertising poster. The piece, evocative of the glamorous Belle Époque, was a hit. Campari enjoyed its fair share of success in the United States for a few decades, but the cocktail trends of the ‘70s, ’80s, and ‘90s pulled public attention away from challenging classic cocktails and toward tiki drinks, sour mix, and novelty martinis. It was a dark time. Of course, regular readers know what happened next: the 2000s and 2010s ushered in the cocktail renaissance. Bartenders started skimming vintage recipe books, experimenting with infusions, shrubs, and bitters, and reviving near-extinct cocktails. One of the most respected of these was the Negroni, a 1:1:1 mix of gin, sweet vermouth, and Campari. The Campari frenzy has even led to two shortages in 2012 and 2015. And a Campari shortage, as it turns out, is an especially serious thing—because nobody knows what’s in the stuff. There is one ingredient that we can rule out: cochineal beetles, which the company stopped using to dye Campari its signature red hue in 2006. Nowadays, vegans can also grapple with Campari’s challenging flavor, which some complain has been compromised since the switch to Red Dye 40. As for me, I’ll still drink Campari six ways to Sunday. It’s traditionally served neat, on the rocks, or with soda in the hot Italian summer months, but this fancier version wouldn’t be unwelcome by the poolside either. This sparkling Sangria-like cocktail is sweetened up with seasonal fruit and a squeeze of orange, making it a great introduction for a Campari-phobe. It features fresh nectarines two ways: mashed and diced. Try to find a very soft, almost overripe nectarine for mashing, and a firm one for dicing. Mix the mashed nectarine and Campari in a large wine glass. Squeeze orange juice into glass, then place the slice in the glass. Top with Prosecco and add ice. Top with diced nectarine and garnish glass with a nectarine slice.